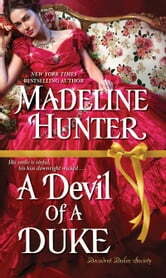 I was lucky enough to be chosen to receive an ARC of A Devil of A Duke by Madeline Hunter. This is the 2nd in the series of the Decadent Dukes Society. The Society consists of three dukes that became friends as boys at school. This book is about Gabriel, the Duke of Langford, and Amanda Waverly, who was trained to be a thief by her parents, but is trying to stay on the straight and narrow. Langford is in the upper echelons of society, and Amanda is making her way in the world as a secretary to a society Original when her former life calls. I enjoyed reading about Langford and Amanda's developing relationship and how they overcome the obstacles facing them. I did think there were a few points at which Amanda gave in to Langford a little too easily where it concerned the intrigues she was involved in. I thought the wrapping up of that part of the story line was a little anticlimactic. I was thinking there would be a little more drama. However, I thought that the ultimate conclusion of that was very clever with property being returned to its rightful place. Amanda Waverley is not your typical young woman. 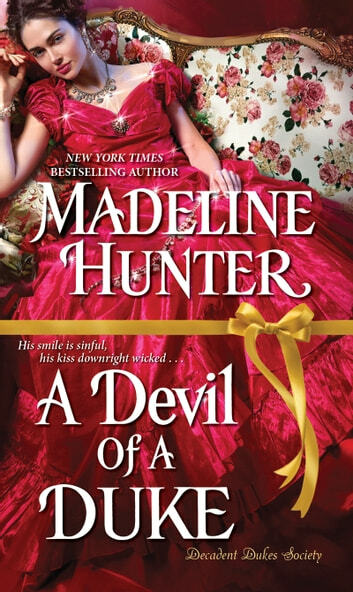 In A Devil Of A Duke, she is the personal secretary of an eccentric old lady. While most ladies choose to employ a male secretary it is considered bizarre that Lady Farnsworth has chosen a young woman for the position instead. Amanda’s background is also unusual. Thankfully Lady Farnsworth did not look too closely into her background and accepted the rather meager references provided. The worst part is that she is being blackmailed to obtain items on behalf of someone who has kidnapped her mother. If she does not comply, her mother’s life may even be in danger. The Duke of Langford, Gabriel St. James, is one of the Decadent Dukes. A club created in childhood with two other boys who were destined to become Dukes. And he is not a huge fan of Lady Farnsworth. That venerable lady had written an article about the nobility neglecting their responsibilities, which had shamed him deeply. It had hit home. Since the article, he has been trying to correct his neglect by attending sessions of Parliament. He had delivered a rather good speech too, but if he was reminded of that journal article one more time he wasn’t going to be responsible for his actions. When Amanda attempts to seduce Gabriel’s brother in order to gain access to his house, which is next-door to the one she needs to break into, Gabriel intercepts. But that might not be too bad, she is able to manipulate the situation and is still able to obtain the item which will help her mother. After falling asleep during their assignation, Gabriel is starting to become obsessed with finding out who this young woman is. He set up another meeting through an advertisement in the newspaper. Unusual Story And Characters Most novels set in this time period Involve members of the ton. And while St. James is clearly a prominent member Amanda most assuredly is not. It is refreshing to have such unusual characters and a unique storyline. It isn’t your average young lady who would consider Breaking into a home, let alone being able to do so successfully. This is the second installment of The Decadent Dukes Society series but works very well as a standalone book. I very much look forward to reading more from Madeline Hunter. Reviewed for LnkToMi iRead in response to a complimentary copy of the book provided by the publisher in hopes of an honest review. 3.75* I’ve received an eARC at no cost to the author. The second book in the Decadent Dukes series brings us the story of Gabriel St. James, Duke of Langford, and Amanda Waverly, a secretary whose parents were thieves and taught her the trade – until she didn’t want to do it anymore. Gabriel never really believed in getting married – or actually loving someone. Love for him was just an infatuation that would eventually disappear – until he met Amanda Waverly. As a simple secretary, Amanda was happy with her life, at least in most aspects. That is, until she is blackmailed to do something that could get her in jail…. or worse. I really liked Gabriel, he was dashing and sweet, more than your regular roguish duke. He was helpful, and always there for Amanda, almost no questions asked. Amanda, on the other hand, wasn’t one of my favourite characters. I liked how she was with the ladies that wrote the Parnassus (a newspaper of sorts) but I didn’t like how she handled the situation that actually got her in danger. At the end of the book, however, she was way more likeable. It was a pleasure to reunite with the other dukes, both Stratton and Brentworth as such amazing characters, and I can’t wait to read Brentworth’s story – I have a feeling it’s going to be the best of the series. The plot was interesting, with theft, blackmail, and love all in the mix, but because I couldn’t connect so much with the main female character, I didn’t enjoy this book as much as the previous one. But I still recommend it, it’s a book with a good and strong hero, good friends that back up the whole story and keep the plot going by keeping the main characters mostly in line and, in the end, it’s a pleasurable read. I read it all in one afternoon. I just love this author's writing style. The hero was exquisite and the heroine was so lovely. Excellent storyline with great characters and great LOVE.